On 17 April 2005, the day that Duncan was running in the London Marathon, Chris, Beth, Bridget, Martin, David Whittaker, Dan Jones, Hilary, Peter and David Mannering kayaked a half marathon distance of 13 miles from Oare Marshes near Faversham to Whitstable and back. Dave M took the marathon theme to the extreme of putting to sea in a marathon K1. The weather was fine and sunny with a slight breeze and a clear blue sky. The waters of the Swale were like a millpond. We launched at about noon from the causeway and paddled straight across to Harty Ferry on the Sheppey side. From there we went up a channel to the North of Horse Sands which were dry at this point. Before long we emerged into the main channel and the water became slightly ruffled as the Swale widened and became more exposed. On this leg of the journey we saw several seals in the water at about 100metres’ distance. 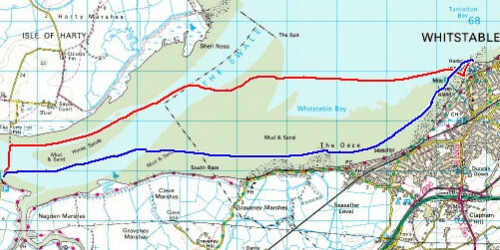 The red line shows the is outward journey, the blue one is the return trip. As we approached Shell Ness we altered course for Whitstable. At neap low water just enough water remained covering the mud and sand of the Spit to allow us to cut the corner and paddle across the bank shaving some distance off the planned outward route. We were soon about two km from the nearest land. As we paddled into the deeper water of Whitstable Bay the group became very strung out. Those at the back later found out that this was because David M’s marathon boat was shipping water and he needed to get to the shore as quickly as he could. As we approached Whitstable the paddlers bringing up the rear saw another seal in the water. We pulled the kayaks up on a small sandy beach immediately to the East of Whitstable Harbour and ordered lunch at the adjacent East Quay fish restaurant where we ate fish and chips outside in the sunshine. Dan also ordered a plate of Whitstable oysters for us to sample. Those who ordered beer with their meals pronounced it to be excellent. After a very satisfying lunch we decided to return to Oare Marshes along the coast, the flooding tide having covered the mud and sand of the Oaze. We passed the colourful sails of a dinghy race and a series of buoys about 200metres offshore warning us to restrict our speed to 8 knots which we were more than happy to do. To our left the shore was lined with houses, beach huts and groynes for two or three miles. The wind had turned 180 degrees and effectively counter-acted any assistance the flood tide might have given us. As we left Whitstable we encountered some small waves which were troublesome for the K1 and we decided to divide the group into two. David Mannering set off at high speed escorted by David W and Dan J and they all soon disappeared from view. By now we were all feeling tired and the final few miles past Graveney Marshes felt like very hard work. As we approached Oare Marshes we could see a weather front approaching from the West and we wondered whether we would get back before it reached us. This thought spurred us on and we were packed up and on the way back to Chiswick before rain set in.